Overlooking the Lehigh River Gorge, Mauch Chunk is one of the most convenient and relaxing weekend getaways locations for both eastern Pennsylvania and lower New York. Mauch Chunk has won several awards for bed and breakfasts, amusements, train excursions, and architecture. Mauch Chunk was founded in 1818 with the discovery of the coal in the area and this discovery lead to its importance in the coal mining and industry—including rail transportation. Mauch Chunk had the opportunity to usher in the use of railway systems to transport coal and thus making it a technological leader in its time. With the popularity of the railroads, Lehigh Coal & Navigation Company built the first roller coaster in the United States, called Mauch Chunk Switchback Gravity Railroad. Take a Ride on the Rail for $0.50 Cents! Several companies tried to foster long term growth within the coal industry. However, the introduction of crude oil and the use of automobiles for transportation caused Mauch Chunk’s importance to fade back into the wilderness. Just as the moon waxes and wanes, so did Mauch Chunk. Mauch Chunk’s name derived from the Lenape people who referred to the mountains as “bear mountain”. They believe that the nearby mountain looked like a sleeping bear. As the bear slept, the financial needs of the Mauch Chunk community grew in importance if it the town was to survive. Turmoil rose within the coal mining industry with Coal barons, union strikes and the Molly Maguires, an Irish-American secret society, who aimed to correct the hazardous working conditions within the coal mining industry. Tried by their accusers, the Molly Maguires were ultimately found to be guilty of their crimes and one of the trials, which ended in a public hanging held in Mauch Chunk in the late 1870s. As the town continued to struggle financially; a set of circumstance lead to a bizarre deal to immortalize an Athlete and to awaken the sleeping bear of Mauch Chunk. Unsuccessfully, Patricia Thorpe requested that Oklahoma raise a memorial statue to her late husband Jim Thorpe. At the age of 41, his career began to wane as the Great Depression began. He struggle financially after his sports career but was never able to recover. Toward the end of his life, his health failed and he lived in poverty. Thorpe died after having his third heart failure. His third wife, Patricia, wished to have a memorial erected in his name where they lived in Oklahoma. However, the request was declined. Angered, Patricia Thorpe made a deal with the town of Mauch Chunk in exchange for his memorial. Mauch Chunk bought Jim Thorpe’s remains and built a monument to house his remains, which overlooked Lehigh River Valley. 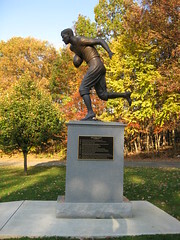 The town raised two statues of Jim Thorpe in athletic poses and historical markers detailing his accomplishments. In addition, Mauch Chunk changed its name to Jim Thorpe, Pennsylvania. While Thorpe had studied in Carlisle, he had never been to Mauch Chunk. Over 60 years later, Jack Thorpe, Jim’s surviving son sued the town for return of Jim Thorpe’s remains under the federal law detailing the “return of Native American artifacts to their tribal homelands”. 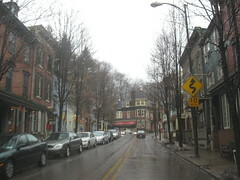 Jim Thorpe is one of the most diverse towns for architecture in eastern Pennsylvania. Present architectural styles include Federalist, Greek Revival, Second Empire, Romanesque Revival, Queen Anne and Richardsonian Romanesque. (Wikipedia, 2012) According to the Mauch Chunk Historical Society (2012), Jim Thorpe was home to 13 millionaires and was known as the wealthiest town – per capita – in America. Of those architectural wonders, the inn built in the 1850s was restored and still stands today to offer weary travelers respite and refuge. For water lovers, Jim Thorpe now offers a variety of water related excursions including whitewater rafting, kayaking, float trips and more. Enjoy the natural setting of eastern Pennsylvania while relaxing on one of your weekend getaways. There are a variety of historical attractions. One that caught my eye was the “ghost walks”, which have costumed people tell their bizarre and ghoulish tales of odd occurrences along a guided tour.